Once you’ve bought your boat, your next priority is to decide where you’re going to moor it. 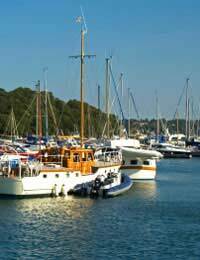 There are several different types of moorings available and your choices will be governed by the type of boat you have, the costs of mooring it and the availability of a mooring spot. If it’s a yacht or some other kind of vessel, it will be a marina or harbour whilst if it’s a narrowboat or a canal barge, for example, you’ll be looking at moorings along a river bank, by the river locks or along a canal towpath. For canal and river boats, you’d need to contact the operator of the particular waterway, e.g. British Waterways or the Environment Agency in most cases although it may be the responsibility of another organisation or perhaps you could obtain a mooring by joining a boat club. For example, the Association of Waterways Cruising Clubs potentially gives you a cheaper mooring option as its members will share many of the maintenance tasks between them. Furthermore, by doing it this way, it enables you to feel a much greater sense of ‘community’ as opposed to going it alone. The costs of mooring your boat will usually be determined by its length and its geographical location. The fact is that many of the most popular areas have long waiting lists so, even if you’ve a strong preference in mind, there are no guarantees that you’ll be able to obtain a mooring straight away in your preferred location and because of the demand, the operators can obviously reflect that in increased costs over other less populated areas. So you may need to look around if you need to find something fairly quickly because unless you’re prepared to simply cruise around virtually non-stop, never staying in one place for more than 2 weeks, then it’s difficult to obtain a licence until you’ve found a permanent mooring. If you’ve the freedom to do that, however, you can moor up temporarily on most canal towpaths free of charge, although there are fees on some rivers, like the Thames, and you can obtain more information about that from the likes of British Waterways. If you’ve a yacht or some other kind of sea faring vessel and you need to moor it in a harbour or marina then you’re looking at the top end of the market in terms of cost. This is because the likes of marinas will also be providing you with additional facilities such as showers, toilets, cafes and clubhouses. Security will often be tighter with electronic gate access only and CCTV etc. Pontoon moorings are the most expensive as this allows you to access your boat by simply walking along a pontoon or jetty as opposed to swinging moorings where your boat is out in the harbour or other stretch of water attached to a buoy whereby to get to it, you’d need some kind of dinghy or other craft to reach it. Marinas are often run by private companies so you’d need to find out who’s responsible for obtaining a mooring and contact them to find out more. Finally, you’ll also need to factor in any costs associated with the moving and lifting of your boat out of the water and things like storage costs in boatyards if you’re not going to be living on the boat all year round as these will not be included in the mooring costs themselves.